In Part One we met Meher and Matt who had a dream to combine Indian and Jewish traditions at their Luxury hotel wedding in Spain. 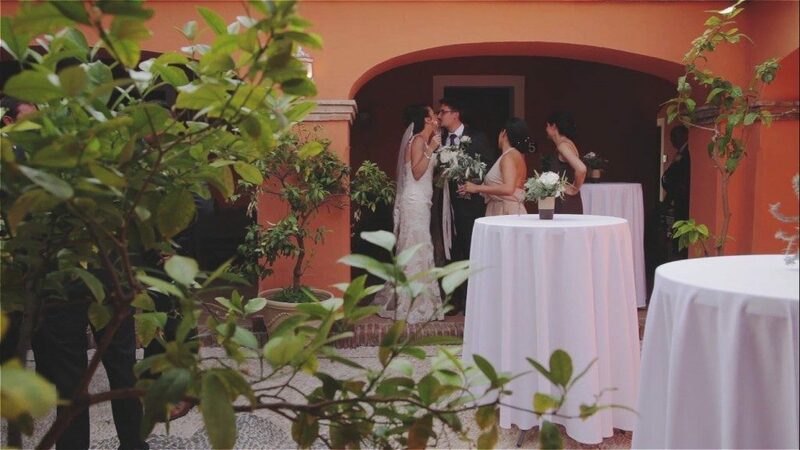 Today we find how Sunshines Weddings Spain coped with such a large bridal party and whether the meeting of two cultures went smoothly. On the big day Meher and her bridal party got ready in the Obama Villa, named after America’s First Lady who stayed there a few years ago. To accommodate such a large bridal party, multiple hair and make-up artists were on hand to look after everyone’s needs. Lorraine headed up the hair and make-up on Meher and her close party and the rest of the party were beautified by the rest of the team. The ceremony started at 7pm due to the heat. This gave the day time to cool down slightly so that guests would be more comfortable. While everyone took to their seats, Quike serenaded them on his violin. It was Scott’s job to pair all the bridesmaids with the correct groomsmen, which was quite a job in itself as there were so many of them. 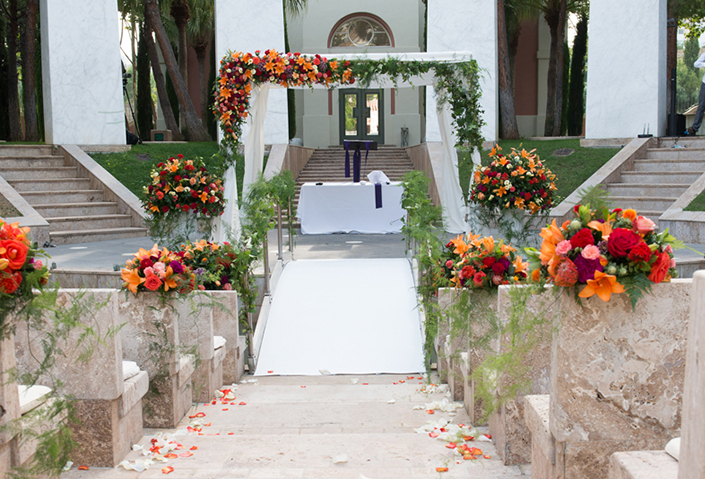 Once everyone was with their assigned partner, they were asked to walk down the aisle one at a time while Matt waited under the beautiful chuppah, which had been dressed in rich, warm toned floral decor, giving a nod to Meher’s Indian heritage. The ceremony itself included a selection of Jewish traditions. Celebrant Jeff wore a kippah and spoke in Hebrew during key parts. Everyone was delighted when Matt finally smashed the glass and cries of “Mazeltov!” filled the air. After the ceremony guests mingled in the amphitheatre, enjoying champagne and canapés while listening to a singing duo who performed well known ballads from the last three decades. Once the official photos had been taken everyone headed to the outdoor plaza which had been decorated with fairy lights and spotlights. 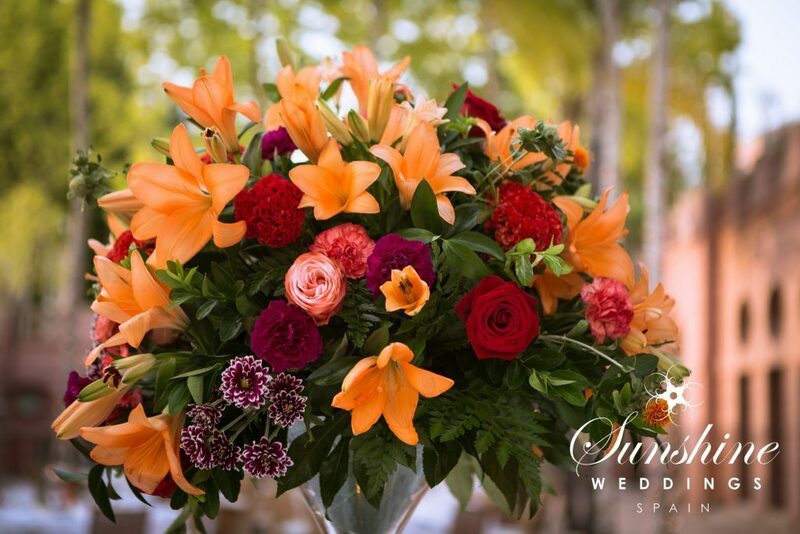 Floral centrepieces continued the warm colour palette theme and tangerine lilies, deep burgundy roses and petite raspberry carnations had been arranged in oversized cocktail vases. After speeches and a sumptuous wedding breakfast it was finally time to hit the dance floor. Everyone moved inside and the guests went wild once DJ Fuller hit the decks. Quike then took it up another level with his electric violin, laser bow, and limitless energy, putting on a show that blew everyone away. When Roberto took to the stage with his sax, the whole party moved up another level. The bridal party danced until 3am, with many guests losing their voices – a sure sign that everyone had had a great time.